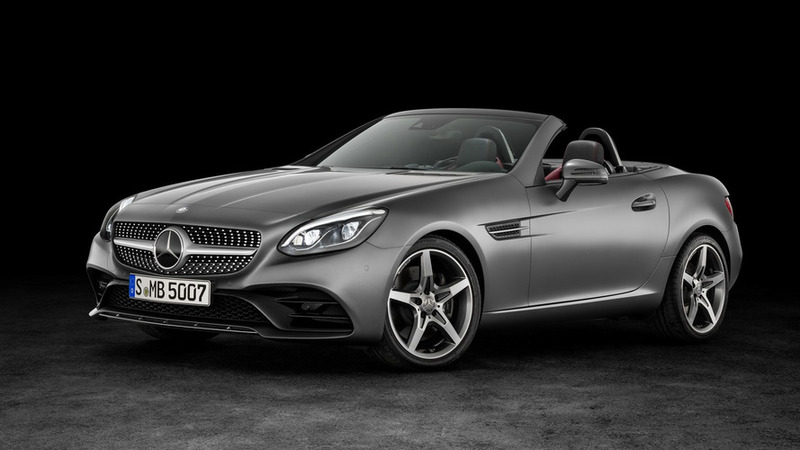 Following its introduction at the Detroit Auto Show, the Mercedes-Benz SLC (SLK facelift) has arrived in UK where it carries a starting price of £30,495. The cheapest SLC money can buy in UK is the base SLC 200 Sport which kicks off at £30,495 for the six-speed manual and from £31,980 if you go for the optional nine-speed automatic transmission. The model comes equipped with halogen headlights featuring LED daytime running lights. Go for the automatic model and you will also benefit from a sports exhaust system. Other standard goodies include remote trunk release, LED taillights, 17-inch alloy wheels, headlamp assist, sports pedals, along with safety kit like Active Brake Assist, Active Bonnet, and Attention Assist. At an additional cost, Mercedes is offering adaptive LED headlights for £1,150 and you can also order the optional Keyless Go package that will set you back an extra £765. The SLC Sport can be had with 18-inch five-twin spoke alloys for an additional £995, whereas the SLC AMG Line gets standard 18-inch AMG multi-spoke alloys. The SLC 200 is powered by a turbocharged 2.0-liter four-cylinder engine with 184 horsepower (135 kW). The same engine is also available in the AMG Line- and auto-only SLC 300 (from £39,385) where it pushes out 245 hp (180 kW). If you would rather have a turbodiesel engine, the auto-only SLC 250d (from £32,995 Sport / £36,995 AMG Line) with its 2.1-liter motor has 204 hp (150 kW). The cream of the crop is obviously the SLC 43 with a biturbo 3.0-liter V6 engine 367 hp and 520 Nm (384 lb-ft) of torque. It sprints to 62 miles per hour (100 kilometers per hour) in 4.7 seconds and can hit an electronically-limited top speed of 155 mph (250 kph). 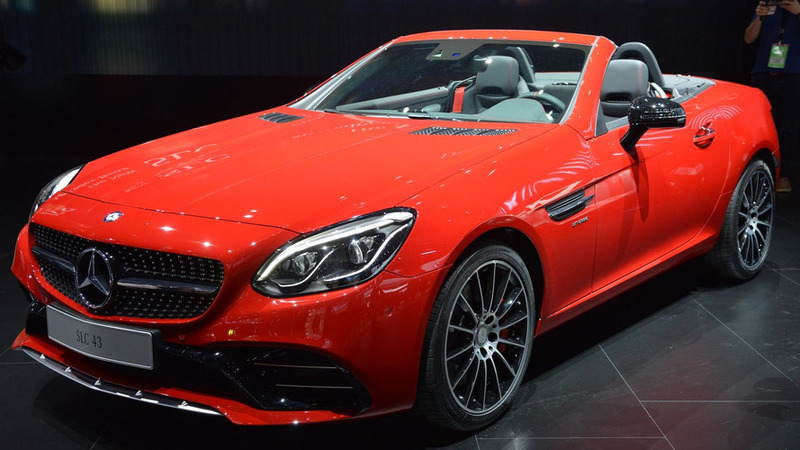 The auto-only flagship version costs £46,355 and Mercedes UK points out it is way cheaper than the defunct SLK 55 AMG which was available for £55,350. 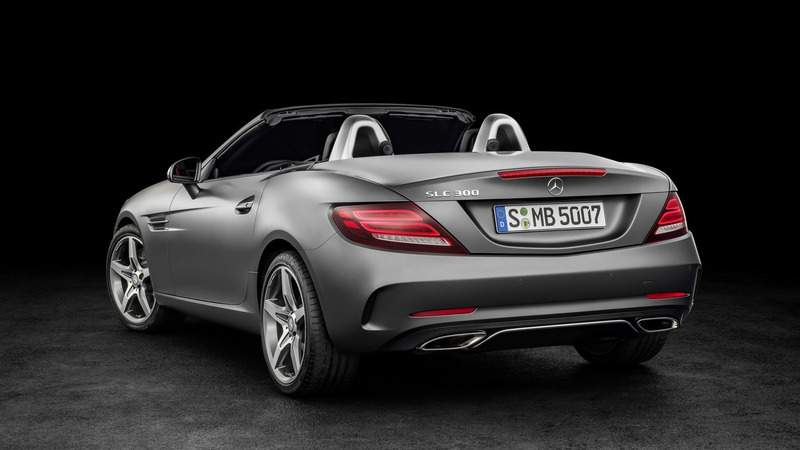 The Mercedes SLC is now available on order in UK, so deliveries should start in the following months.